Sister M. Elizabeth Ann Kealy, I.H.M. Sister M. Elizabeth Ann Kealy, I.H.M. 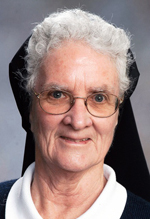 (formerly Sister M. John Bernard), died June 13 in Camilla Hall, Immaculata. She was 73 and in the 55th year of her religious life. Born in Mount Carmel, Pa., she entered the Congregation of the Sisters, Servants of the Immaculate Heart of Mary in 1963 from Our Lady of Mt. Carmel Parish and professed her vows in 1965. Sister Elizabeth Ann taught in elementary schools in the archdioceses of Philadelphia and Atlanta, and the Diocese of Allentown as well as serving for 17 years in Peru and Chile. Sister Elizabeth Ann’s last assignment was as a director of religious education for nine years in the Ashland/Shenandoah, Pa. parishes. She retired in 2014 to Camilla Hall for the Apostolate of Prayer. The funeral Mass was celebrated June 19 at Camilla Hall. The principal celebrant and homilist was Msgr. Joseph Logrip. Also concelebrating was Father William E. Dean and assisting at the altar was Deacon Thomas O’Brien. In addition to her loving congregation of IHM Sisters, Sister Elizabeth Ann is survived by her sisters, Sister Marie Hubert, I.H.M., Ellen Pels (Robert), Loretta Vancho, Patricia Kealy and her brother, John Kealy. She was predeceased by her parents Hubert and Catherine (Houston) Kealy and her brother, Father Hubert Kealy.